PN MPs Kristy Debono and Hermann Schiavone. 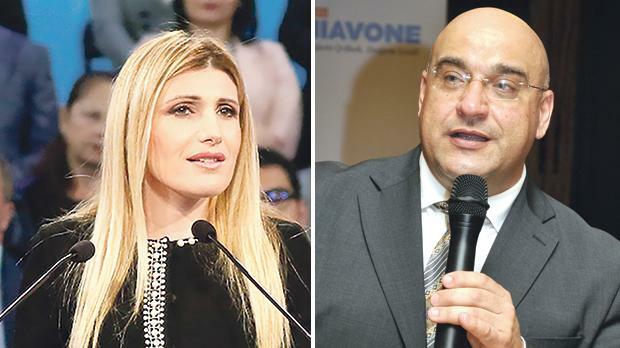 Nationalist Party MPs Kristy Debono and Hermann Schiavone on Friday met the owner of once-secret Dubai company 17 Black to seek “possible sponsorship” related to a conference. Last year, in a joint investigation by the Times of Malta and Reuters, Yorgen Fenech was identified as the owner of 17 Black, which had been named in leaked e-mails as one of two companies that would pay $2 million to Panama companies belonging to the Prime Minister’s chief of staff Keith Schembri and Tourism Minister Konrad Mizzi. The PN has called for the pair’s resignations over what it considers a major scandal blighting the country’s international reputation. Sources told The Sunday Times of Malta on Saturday that at around 11.15am on Friday, Ms Debono and Mr Schiavone walked into the office of Mr Fenech on the 21st floor of the Portomaso Tower. Contacted on Saturday, Ms Debono initially denied holding such a meeting and when pressed by The Sunday Times of Malta to state whether or not she had indeed met Mr Fenech, the MP and president of the PN’s General Council asked for questions to be sent via e-mail. In reply to these questions, Ms Debono confirmed meeting the Tumas Group CEO and Electrogas power station director, saying that she had met Mr Fenech “to discuss possible sponsorship of a small conference room”. “My intention was to organise this conference, which is on my own initiative and non-profit making. Hence, I shortlisted a number of possible conference venues, in the St Julian’s and Swieqi vicinities. “I met Mr Fenech to discuss possible sponsorship of a small conference room and informed him that I am considering as well other venues. Had this materialised, I would have listed the company as a sponsor,” Ms Debono said. When contacted, Mr Schiavone was evasive, saying he had no explanation to give. Mr Schiavone confirmed the meeting at Portomaso but refused to say whom he had met. Ms Debono however, confirmed meeting Mr Fenech with Mr Schiavone, saying she went accompanied to Mr Fenech’s office because she did not do “any backroom deals or engage in any conflicting matters whatsoever”. Mr Schiavone, she said, was assisting her in the organisation of the conference’s speakers. While she explained to the newspaper what the conference was going to be about, she said she did not wish such details to be divulged as the event had not yet been made public and its organisation was still at an early stage. Mr Fenech has denied any wrongdoing or links to the Panama companies of Mr Schembri and Dr Mizzi. Both Prime Minister Joseph Muscat and his chief of staff had said when the story on the ownership broke that they were unaware who owned 17 Black, while Dr Mizzi insisted he had “no connection” to the company. Opposition and PN leader Adrian Delia has branded the 17 Black revelations as one of the country’s biggest scandals, calling for the immediate resignation of both Mr Schembri and Dr Mizzi. He argued that the series of stories on the offshore holdings of a senior Cabinet minister and the Prime Minister’s top aide were causing untold damage to the island’s international reputation. At one point he said that if the two men did not resign immediately over the revelations, the Prime Minister himself should step down. #17Black has been exposed as being involved in criminal activity + corruption. Those that worked to expose the truth did so at great personal risk + sacrifice. Asked whether she deemed meeting Mr Fenech acceptable given how critical the PN has been of his 17 Black link, Ms Debono said that party had “never issued any directive for boycotting establishments owned by Tumas Group”. “In fact the party and party representatives held political events in these establishments till recently. I will honour any directives issued by the PN as I always did,” Ms Debono added. She did not reply to questions on whether Dr Delia had been made aware of the meeting.